and is the avalanche joseki. If Black plays here, then we get the small avalanche. Subsequently, to are all forced. 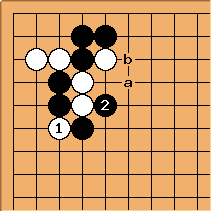 Notice that threatens to capture the two key white stones in a ladder at x. 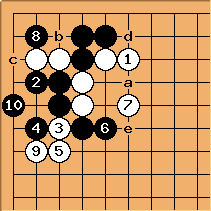 The typical response for is at a, possibly leading to the canonical joseki. However, if the ladder is favourable for White, then can also be played at b. 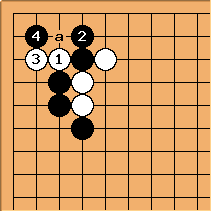 This is the canonical joseki for the small avalanche, most often seen in the literature. is the most usual answer, but there are other variations. 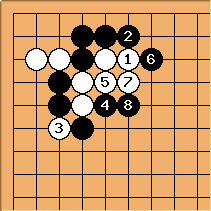 After , the stones cannot be saved, so Black goes for the upper side instead. 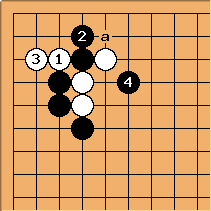 This canonical joseki is also the simplest small avalanche joseki because both groups are settled. 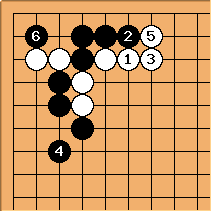 White has some influence along the left side as well as points on the corner, but Black’s thickness on the right is truly impressive, after having captured two stones. Also note that Black’s influence is along the upper side, which is typically more important than the left side when White chooses to play the avalanche. For beginners, it is worth noting that cannot capture the stone by playing at , because then Black will capture all the White stones in a connect-and-die with a move at . There are cases where White omits in the previous diagram, but they are rare. 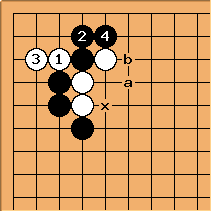 A likely continuation when Black pulls out with is shown here. 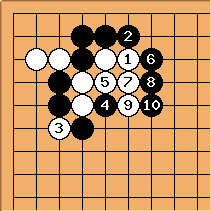 In this diagram Black has played on both sides - the difference from the normal joseki is large. 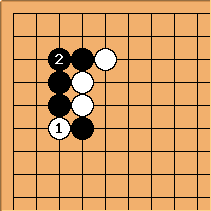 If White does not want Black to get quite so strong, she can play here immediately. 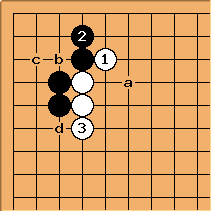 It might seem that White has a chance to fight with a move around a after , but the fight will not be hard for Black: if he captures the stone, White will not be able to make two eyes herself, so she is likely to come back to the corner group to connect this stone at an early stage, after which Black has the time to easily deal with any attack White might have made in between. at the vital point is a strong move which provokes a fight. Up to there is little room for variation. The joseki continues with these moves, but the fight is just beginning. The Black group in the center and the White one on the top will have to fight it out afterwards. White may choose to give atari at a before playing . This will make White b sente, but the value of White c is diminished. Black, for his part, might play d or e instead of . is yet another possibility. 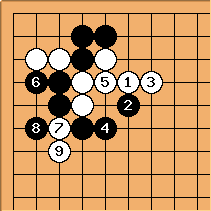 Black takes a considerable corner territory, but the and stones are obviously weak. 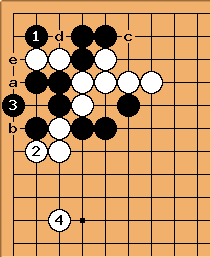 Instead of , Black can also play at immediately; the most likely outcome is still this same position through another move order. 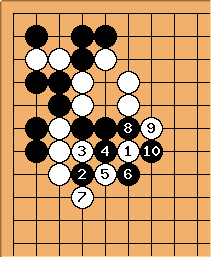 puts heavy pressure on the stones, but giving them up obviously gives White too much thickness; Black therfore struggles out, at the price of giving White good shape while having bad shape himself. White keeps pestering the black group. After , White will extend along the side, but we are getting into the zone where the influence of surrounding stones on the exact moves is too large to speak of established joseki. If Black does not want his stones to get that weak, he can forsake and play here. 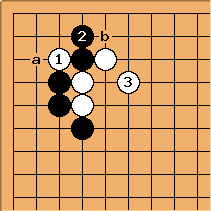 After , White will most likely extend somewhere around a, the exact location depending on the surroundings, and Black is still facing a difficult battle for his center stones. 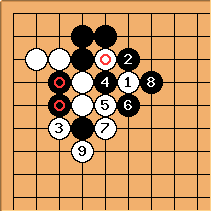 If the ladder towards the lower right corner favours White, then can extend here. Then the sequence here is most common. With , Black has saved his corner, but still must face the center fight. The continuations are the same as above, but makes better shape than White a. Apart from the extension along the left side, White e is also an interesting possibility. may be played at b or c. With , White will get better endgame benefit if White gets to play at d. With at b or c, White can get some endgame benefit on the left edge instead. The ladder referred to in the commentary to the previous diagram is shown here. White should play this only if the ladder of does not work. Charles Matthews: This absolute statement needs to be qualified by a sacrifice variation from Korea. See Jungsuk in Our Time. If the ladder does work for Black, the only way for White to avoid an immediate collapse is to extend at . However, this is too submissive. 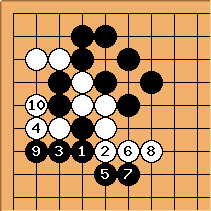 now is enough to capture the corner, and Black’s advantage is immediately apparent. On the other hand, if the ladder favors White, is uncommon but not unheard of. 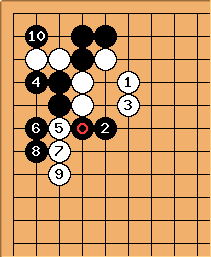 The only joseki for this situation is this one. Eventually, Black makes a wall towards the top but gives both the left side and much of the corner to White. It was developed in Korea in the late 1980s. There is also a variation where Black plays at instead of a. This is a trick play, but the refutation can be difficult to find. See small avalanche - trick play for more. It would be a mistake to cut at . 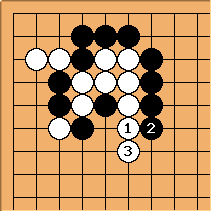 Black simply connects with , and White’s position is in pieces. unkx80: Please explain why or a is a mistake that results in considerable White thickness. 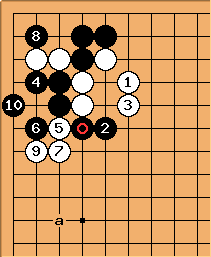 In the joseki, should be played at a or b. 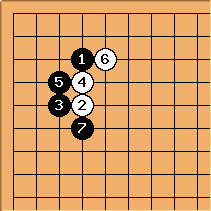 If cuts directly, then captures the two key stones, and typically this means “game over”. PJTraill: Please indicate how Black should respond to White playing without defending his cutting stone at a (said above to be forced): should Black immediately play at a himself or first play some other forcing move?. Uberdude: Capture at a is good for Black. 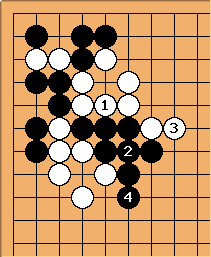 White does get to block on 2nd line in sente which is kinda nice, but Black’s hane on left side up to 4th line is even nicer (a white cut fails) and White’s 2 stones are short of liberties. Maybe Black could think about pushing at b first to get an even better result if White blocks, but that gives White a chance to correct her mistake and extend at a and it reverts to one of the standard joseki variations. Compare to this variation and tewari. 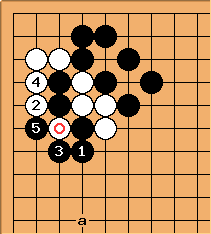 After Black’s descent to 2 (which was often thought of as submissive, but AlphaGo seems to like it if the ladder for small avalanche is not good) White should extend at 3, the vital point for liberties for her stones and development of left side. But instead it’s like White played a and allowed Black to get the key point of 3. Cutting at b for c could be seen as a probe because if Black ataris the other way to avoid the block on top being sente then White can cut at d so that might not be a minus. but a for 3 is awful for White.